The delivery time lies between 2-4 working days (depending where you are located). It can take longer during the weekends, due to that PostNL doesn't deliver on Monday. We ship the products the same day the order has been received. How many laces are there in a package? There are always two laces in one package. This means that if you buy one of our products, you always get two laces (one for each shoe). If you are not happy with the product, or there is something wrong, then you can return them within 30 days. Please get in contact or send them to us. We will send over the new pair of triathlon laces as soon as we have received the old pair. We also offer refunds within 30 days. Yes we do. We offer free worldwide shipping! Our products are sent from the Netherlands, so delivery times may vary depending on your location. Our products are send from the Netherlands, from our office in Amsterdam or Sint Pancras. 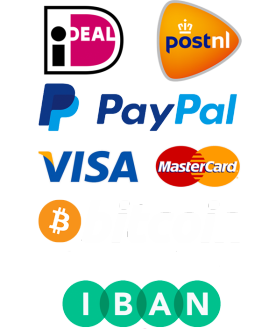 We offer the most popular payment options like iDeal, PayPal, Creditcard, MrCash/Bancontact and even Bitcoin. We send our products per mailbox post, therefore we can offer them for a great price. If you would really like to have a Track & Trace code, we can take care of that, but we will charge extra money. If you would like Track & Trace, please get in contact with our service desk. TriathlonLaces.co.uk sells only the best quality triathlon laces. We guarantee you, as a specialist in triathlon and elastic laces, that we provide you the fastest time possible in the triathlon transition area. Our triathlon laces give you the same advantage as every other elite athlete. Be fast or be forgotten! © 2019 Triathlon Laces. All Rights Reserved.